on the home/office oceanfront balcony. Display is updated every 60 seconds. Confessions of a "weather nut"
1. In my open-cockpit biplane flying adventures, I needed to make short term, long distance micro-weather (down to the "neighborhood" level) predictions. Errors could have had fatal consequences. Endurance flying adventures also require predictions for very large geographic sections and over longer periods, for trip planning. 2. 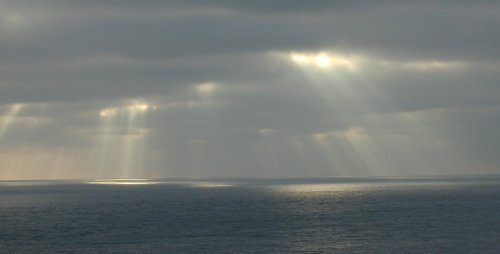 Living in a place where several ecosystems (ocean, desert, mountain) come together, and where there is a 95% chance of prevailing winds from the west, and living atop a cliff facing west, I get to see weather coming from a long way off, and I experience it pass over me as it changes into something else. 3. I have been operating a private weather station for about 7 years and making the data available Live on the website. However, weather predictions are missing. It is possibly not the fault of the predictors, for they are being asked to predict weather in a way that is meaningful to the masses. Your needs are different. They won't tell you anything about the area surrounding your horse farm. They need to predict for an entire city, or the section of the country, and make it brief, and somewhat intelligible to the average high school student. And do it fast. Cheap. That's what they get paid to deliver. anything else, it's up to you. All the data is there for you to take a crack at doing better than the experts, and to predict for your particular area of interest. Some of the world's largest supercomputers are engaged in weather analysis and prediction. It's a big job to deal with all the constantly changing variables. I find it all very enjoyable, especially from my hammock! The best book about the weather I've read is Guy Murchie's Song of the Sky (1954). It's high adventure and life and death consequences of flying in adverse weather. Sheer poetry in some parts. Mr. Murchie was a career flight navigator on long distance airline and military flights, and he navigated around and through virtually every weather situation known to this planet. Maybe only a fellow aviator could understand such fascination with, and respect for, the weather. My father turned me on to this great book. He has weathered many storms. You can not put this book down! The current weather station ("WX-2") was built on the Arduino based kit sold by ManyLabs. It was my first project after learning the basics of electronics and the Arduino in an 8-hour class taught at MakerPlace by Victor Cicciarelli of 3RSRobotics. This weather station was built entirely on a Sunday afternoon, March 9, 2014. The hardware was easy enough, but the software was more of a challenge, and I got great support from Elliott at ManyLabs. Thank You, Elliott! This current weather station replaces the previous system, below. Weather station One ("WX-1") came to life during the full moon hours of June 16, 2000. If you are thinking of getting a weather station, get a RainWise. They are first class folks. not even for shipping, no questions asked. That's service! The software is WeatherView 32 Professional Version 7.
the Atomic Clock source to cross-check the Time of Day clocks used in this web server. If you feel that any of these measurements are inaccurate, please contact me. Del Mar weather station shows current conditions continuously updated. Data includes barometric pressure, humidity, wind speed, direction, chill, and sky conditions. Graphs show last 24 hours for temperature, wind speed, humidity, pressure and rainfall in Del Mar. Also shows sunrise, sunset times for Del Mar, (also moon rise, moon set and moon phase).